I promise this is the best $15 (it's normally $20, but I got it on a price cut) I ever spent. And it was on a tunnel from Target. 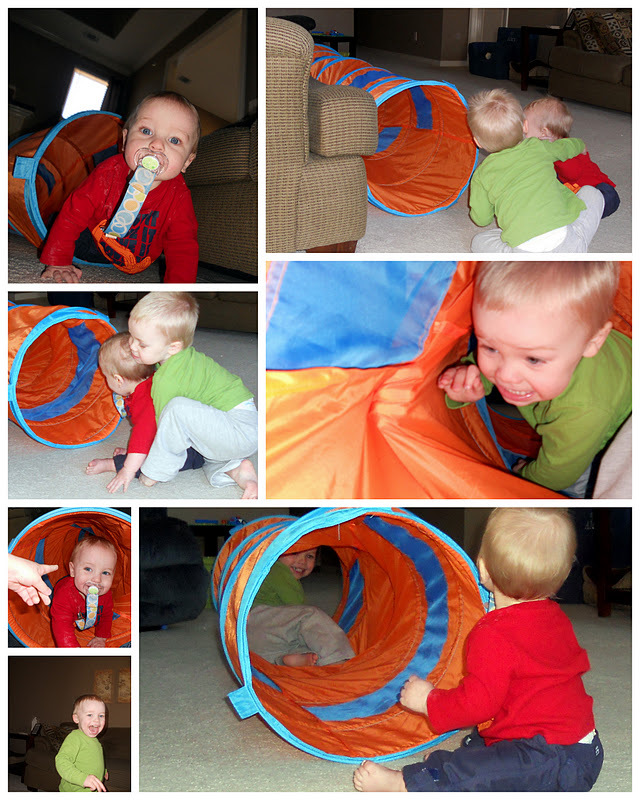 I got this tunnel when Andrew was about the same age (8 months old or so) that Alex started to play with it. So much fun and a GREAT way to burn off the crazy mega-energy that these two have in-between lunch and nap time. WHEW! By the way...if you don't have a tunnel for your crawler and older...GET ONE! Andrew gets a little wild with the tunnel - like, he gets in and then rolls around in it ALL OVER THE LIVING ROOM...which is why the coffee table has been moved out of the way. LOL They are so funny. I love just watching them play! Andrew helps Alex go into the tunnel. He plays peek-a-boo in the tunnel with him. It's hilarious! I got a little movie out of our fun afternoon, too. Enjoy! And just for fun! Here is a blast from the past! Here is a picture of Andrew in the tunnel at 9 months old. Alex is now 9 months old! I love comparing their pictures like this - too cute! Isn't that cool?! Love it!! Wait until you see the next post with "learning to walk pictures!" FUN!! Aw! How cute! They grow up so fast, don't they! My two boys look so much alike too. It's crazy looking back at older pics! Thanks!!! It is crazy! I'm amazed at how much faster it seems with my 2nd one though. Wow.